Motorola's cordless Symbol LS4278 provides superior bar code scanning in a durable future-proof device that delivers an outstanding total cost of ownership. Workers can move within a 50 ft./15 m radius to scan items — and the elimination of hazardous cables creates a safer work environment. From cashiers moving around the register to scan large, heavy items and check for missed items to healthcare workers double checking that the right patient is receiving the right medication, integrated Bluetooth wireless personal area networking (WPAN) provides reliable and secure wireless transmission of data between the scanner and your host. Productivity is improved, revenues are protected and potential liability due to injury from lifting heavy objects is reduced. 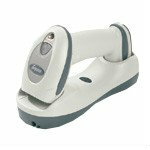 The Symbol LS4278 is designed to deliver exceptional scanning performance. Users can scan objects at any angle — the innovative multiline rastering scan pattern eliminates the need for exact aim and positioning of the scanner. The laser line moves vertically during scanning, allowing accurate capture of even the smallest, stacked and poorly printed bar codes on the first scan. And with superior motion tolerance, users no longer need pause between scans, further increasing productivity. The Symbol LS4278 scanner and cradle are designed to withstand all day every day use, from drops to spills, with features that deliver maximum uptime and investment protection. The scanner's patented single board construction eliminates the most common point of failure — the interconnection between multiple boards. Even if the scanner is accidentally dropped, a five-foot (1.5m) drop specification ensures continuous reliable operation. The scanner and cradle offer industrial charging contacts that eliminate wear when cradling the device, providing a reliable charging connection through hundreds of thousands of insertions — other common charging techniques show wear between 5,000 to 10,000 insertions. Drain points are designed into the cradle to protect sensitive internal electronics from accidental liquid spills. Built-in enterprise durability combines with Motorola's Enterprise Mobility Services to deliver a low total cost of ownership. These comprehensive services are available to assist in rapid deployment as well as provide the ongoing support you need to maintain peak performance — and achieve maximum uptime and value.